Travel around the world in a balloon gathering gems. Is there a better alternative to Pigllionaire? Is Pigllionaire really the best app in Card and Board category? Will Pigllionaire work good on macOS 10.13.4? Pigllionaire... Embark on a fantastic journey! As a Piggybank your objective is to become rich, of course, and in order to do so you will travel around the world in a balloon gathering gems. 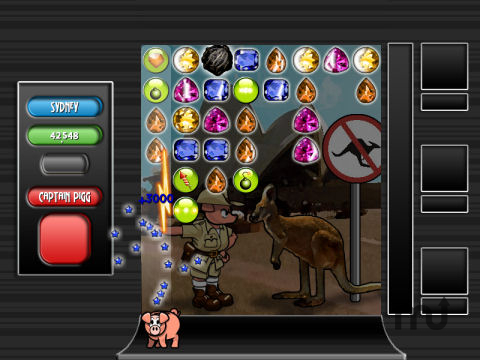 Match three gems of the same type to make them blow up and earn money. You will start as a simple Mindless Drone, but in time, with enough money you can become a successful Yuppie, a CEO or even a true Pigllionaire! Pigllionaire needs a review. Be the first to review this app and get the discussion started! Pigllionaire needs a rating. Be the first to rate this app and get the discussion started! Along the way you will encounter traps that will fall from the sky which you must avoid. Nets, anvils, lightning and other hazards will try to stop you from getting those gems. But luckily, you can get powerups which will slow down time, give you a powerful suit of armor and more. Many more features.